Volunteer opportunities are event based. This means that to create a volunteer opportunity, you first need to create an event to which to attach the volunteer opportunity. This makes sense as volunteer opportunities are typically associated with some event at the school, be it a field trip, teachers appreciation breakfast, fund raiser, etc. It is also important to consider where to create the event. If you are looking for volunteers from the whole school, such as for a major fundraiser, create a school-wide or PTA/PTO event. 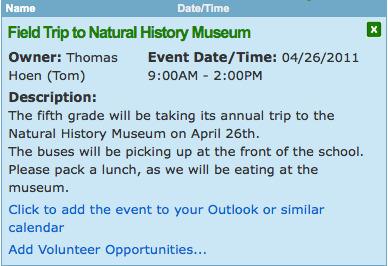 If you are looking for chaperones for a class field trip, add the event on the appropriate class page. If it is for a group, such as a school play, create the event on that group’s page. By creating the event on the appropriate page, when you send a request for volunteers, it will only go to the parents associated with that event. If you have not done so already, go to the desired page (class, grade, group, school, etc) and add an event (click the Add Event button and fill in the information). Once the event is created, click the view button (the paper with a corner folded down beside the event in the events list). You will see a window similar to the one displayed above (but with your event information). Only you, as the event creator, or users that are school admins will see the link to create volunteer opportunities. Volunteering – For signing up volunteers for just this event (use the main Volunteering page to sign up people for any event/volunteer opportunity). By default, the Manage Volunteer Opportunities tab is shown. On this page, you may add new, delete, or modify volunteer opportunities.